If you’ve been hit by a car as a pedestrian, there are likely some complexities to how you’ll be compensated for your injuries. Accidents involving pedestrians often cause significant and life-changing injuries, and victims are usually forced to miss extended time from work. A victim’s best course of action to get money for their injuries, lost wages and pain and suffering is to file a personal injury claim against the at-fault driver. 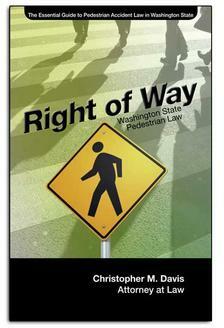 Hiring an experienced pedestrian accident lawyer is often the best way to make sure you get everything you deserve. Insurance issues that arise during your case are best left to your attorney. Your case and how much it’s worth is determined by the law of negligence – the individual who failed to use a reasonable standard of care will likely be considered negligent. For insurance purposes, your compensation as a pedestrian would be based on the driver being at-fault. Who Pays For The Pedestrian’s Injuries? In Washington State, drivers are required by law to carry a minimum of $25,000 in liability coverage. In the event of a serious accident with a pedestrian, the injured person’s medical expenses, lost wages, etc., are very likely to quickly exceed the insurance limits. In some cases, an injured pedestrian can pursue compensation from the at-fault driver individually. But unless the driver is financially able to pay for the injuries out-of-pocket, any court judgment against the driver would be difficult to collect. When the above happens and the driver’s insurance is not enough, the pedestrian’s own auto insurance kicks in. Personal Injury Protection (PIP) and Uninsured/Underinsured Motorist (UM/UIM) coverage can help you if you were injured as a pedestrian if you were injured by a vehicle. If the at-fault driver’s liability and PIP coverage is exceeded, a pedestrian can use their own auto-PIP coverage, even if they weren’t in a car. In Washington State, auto insurance companies are required to offer PIP on every policy. Anyone declining PIP coverage must do so in writing. PIP is extremely beneficial because it is considered “no fault” coverage. If you’re unable to have all your bills paid for by the at-fault driver’s insurance, UM/UIM coverage kicks in. An injured pedestrian can use their own uninsured/underinsured coverage to pay for their own medical bills. The strong, aggressive personal injury attorneys at Davis Law Group, P.S., will take upon themselves the burden of your pedestrian accident legal case, and do the fighting and the legal muscle work for you so that you don’t have to. This will take a huge load off your mind and allow you to focus entirely on your recovery, which is what you should ideally be doing after an accident. Davis Law Group attorneys are extremely skilled at handling pedestrian accident cases. Attorney Chris Davis has over 20 years of experience dealing with these types of cases, and recovering maximum compensation for his clients. Contact Davis Law Group today for a free case evaluation. Call (206) 727-4000, use the chat feature below or fill out the form on this page to get started.